Business and IT Impact Analysis Questionnaire - The role of IT in many organizations has evolved from supporting the business to enabling the business - a shift that requires IT to transition from being mostly tactical and cost focused to being an enabler of the overall strategy and value focused. IT organizations that have successfully made this change have done so by among other things transitioning their culture from a reactive operationally focused caretaker of assets to a proactive strategically focused enabler of business value. This culture of performance and value ensures that IT's human capital is aligned with the strategic goals and motivated to execute. Cultural change is typically a messy and lengthy process, but it must and can be done. Understanding how your business works -- which processes must interlock and be continuously available to sell, produce and support your clients -- is the foremost goal of a business impact analysis. Diverse tactics to balance recovery costs with different risk thresholds. 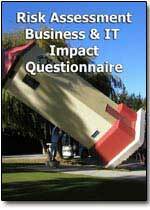 This Business and IT Impact Analysis Questionnaire has been designed by one of Industry's most experienced application assessment consultants. This Questionnaire has been used in over 500 assessment, DRP and business impact projects in the past four years. 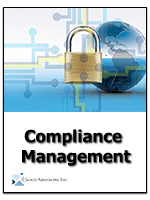 Included is a Risk Ranking definition. The Word version of the questionnaire is automated with check boxes that can be updated in Word.